Submitted by Satinder P S Puri on Mon, 09/21/2015 - 00:13. VOTE NO ON SIN TAX CAMPAIGN OUTSIDE FIRST ENERGY STADIUM DURING OPENING GAME OF 2015-16 FOOTBALL SEASON BETWEEN THE CLEVELAND BROWNS AND THE TENNESSEE TITANS! Needless to say, our valiant Browns defeated the visiting Titans: 28-14. BING IMAGES ON VOTE NO ON SIN TAX, ISSUE 8, ON NOVEMBER 3, 2015 CAMPAIGN IN CUYAHOGA COUNTY, OHIO! Submitted by Satinder P S Puri on Sat, 09/19/2015 - 18:16. Submitted by Satinder P S Puri on Tue, 09/15/2015 - 00:42. VOTE NO ON SIN TAX, ISSUE 8, CAMPAIGN AT THE ANNUAL LABOR DAY PARADE ALONG KINSMAN AVENUE ON THE EAST SIDE OF CLEVELAND, OHIO ON A VERY HOT AND BEAUTIFUL MONDAY, SEPTEMBER 7, 2015, MORNING & AFTERNOON! Submitted by Satinder P S Puri on Sun, 09/06/2015 - 00:42. Submitted by Satinder P S Puri on Sun, 08/23/2015 - 11:10. Submitted by Satinder P S Puri on Sat, 08/08/2015 - 22:43. LATE NEWS: 26TH ANNUAL PARADE THE CIRCLE EVENT WELCOMED VOTE NO ON SIN TAX CAMPAIGN! Submitted by Satinder P S Puri on Fri, 08/07/2015 - 09:45. LATE NEWS: 26TH ANNUAL PARADE THE CIRCLE EVENT WELCOMED VOTE NO ON SIN TAX (ON NOVEMBER 3, 2015 IN CUYAHOGA COUNTY, OHIO) CAMPAIGN! Submitted by Satinder P S Puri on Tue, 08/04/2015 - 23:32. DONALD TRUMP SPOTTED IN CLEVELAND’S JEFFERSON PARK RUBBING SHOULDERS WITH A TOWEL-HEADED IMMIGRANT! JULY 2015 CLEVELAND CRITICAL MASS MEETS WELCOME JIMMY DIMORA SQUARE CAMPAIGN! Submitted by Satinder P S Puri on Sun, 08/02/2015 - 00:59. JULY 2015 CLEVELAND CRITICAL MASS MEETS WELCOME JIMMY DIMORA SQUARE CAMPAIGN IN DOWNTOWN CLEVELAND, OHIO! WELCOME JIMMY DIMORA SQUARE – a.k.a. PUBLIC SQUARE, CLEVELAND, OHIO -- A PRODUCT OF CLEVELAND’S CORRUPT SYSTEM! Submitted by Satinder P S Puri on Sat, 07/11/2015 - 21:46. Submitted by Satinder P S Puri on Tue, 07/07/2015 - 23:03. CLEVELAND, OHIO, CELEBRATED INDEPENDENCE DAY, 2015, WITH MUSIC, FIREWORKS, A PARADE, AND MORE FIREWORKS – IN THAT ORDER – BUT NOT ALL ON THE SAME DAY. JUNE 2015 CLEVELAND CRITICAL MASS MEETS WELCOME JIMMY DIMORA SQUARE CAMPAIGN! Submitted by Satinder P S Puri on Sat, 06/27/2015 - 09:17. JUNE 2015 CLEVELAND CRITICAL MASS MEETS WELCOME JIMMY DIMORA SQUARE CAMPAIGN IN DOWNTOWN CLEVELAND, OHIO! Submitted by Satinder P S Puri on Sun, 05/31/2015 - 20:55. MAY 2015 CLEVELAND CRITICAL MASS MEETS WELCOME JIMMY DIMORA SQUARE CAMPAIGN IN DOWNTOWN CLEVELAND, OHIO! 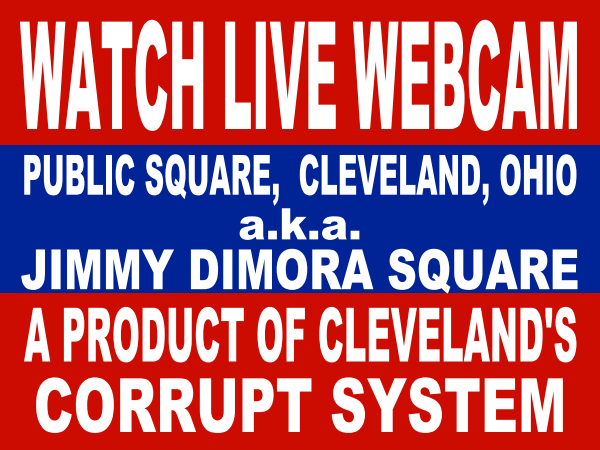 WELCOME JIMMY DIMORA SQUARE – A PRODUCT OF CLEVELAND’S CORRUPT SYSTEM! THE SENSELESS DESTRUCTION OF 218-YEAR OLD PUBLIC SQUARE A.K.A. JIMMY DIMORA SQUARE IN CLEVELAND, OHIO! Submitted by Satinder P S Puri on Sat, 05/09/2015 - 22:11. THE SENSELESS DESTRUCTION OF 218-YEAR OLD PUBLIC SQUARE A.K.A. JIMMY DIMORA SQUARE IN CLEVELAND, OHIO! WELCOME JIMMY DIMORA SQUARE – A PRODUCT OF CLEVELAND’S CORRUPT SYSTEM! Submitted by Satinder P S Puri on Fri, 05/08/2015 - 13:23. Submitted by Satinder P S Puri on Sun, 05/03/2015 - 19:19. Submitted by Satinder P S Puri on Mon, 04/20/2015 - 13:34. Submitted by Satinder P S Puri on Mon, 04/06/2015 - 22:49. Submitted by Satinder P S Puri on Sun, 04/05/2015 - 00:34. Submitted by Satinder P S Puri on Fri, 03/20/2015 - 12:25.
and a compliant and corrupt media is not an easy one. DOWNTOWN CLEVELAND ROCKS WITH PRESIDENT OBAMA’S VISIT & PROTESTERS ON THE TENTH DAY OF HUNGER STRIKE! Submitted by Satinder P S Puri on Wed, 03/18/2015 - 23:31. DOWNTOWN CLEVELAND, OHIO ROCKS WITH A FLYING VISIT FROM PRESIDENT OBAMA AND PROTESTERS ON THE TENTH DAY (Wednesday, March 18, 2015) OF HUNGER STRIKE! Submitted by Satinder P S Puri on Tue, 03/17/2015 - 23:24. (Tuesday, March 17, 2015) OF HUNGER STRIKE! FOURTH DAY (March 12, 2015) OF HUNGER STRIKE: VIEWS FROM PUBLIC SQUARE! Submitted by Satinder P S Puri on Fri, 03/13/2015 - 00:02. FOURTH DAY (March 12, 2015) OF HUNGER STRIKE: VIEWS FROM PUBLIC SQUARE DURING A 2-HR. DEMONSTRATIO IN CLEVELAND, OHIO!